Discover the Complete $100k Info-Entrepreneurs Formula That Gets You Total Lifestyle Freedom! Are you trying to build an info business but you are stuck? Are you struggling to get your first 1000 followers or "tribe members"? Are you struggling to make that first $1000 online? Do you want to change the world with one great idea, but you just don't know how to get started, how to create the platform and the initial traffic, emails, and products? If so, you need a world-changing idea, then you need a traffic platform where people can come to you and get to know you, then you need an email campaign, then you find out what they need and either promote affiliate programs that meet those needs, or, better yet, over time, create your own products. 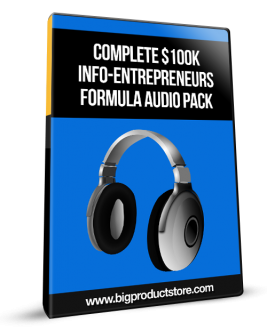 Introducing ...Complete $100K Info-Entrepreneurs Formula Audio Pack ..